This blog was originally published for Getting Smart. In less than 30 days over 15,000 edupeople will descend upon the City of Brotherly Love for ISTE 2015. With more than 900 sessions, three keynotes, and over 500 companies involved, it is pretty important to do some thinking about how you want to spend your time at this behemoth of a conference. And, that is usually my mindset too–How can I make the most of (insert conference name)? I mean the majority of us in the eduspace are on pretty tight budgets and already carefully weigh the costs and benefits of each event. We work booths for company friends, sign up to teach summer school, write grants and blog posts and letters to our principals, and save up so we don’t miss out. As a result, we want to squeeze every last drop: filling our bellies with all the free cheesesteaks (there will be free cheesesteaks right? ), our conference bags with all that swag, and our minds with as many sessions and ideas as possible. This year I am looking at things a little differently–thanks to a little help from my friends. 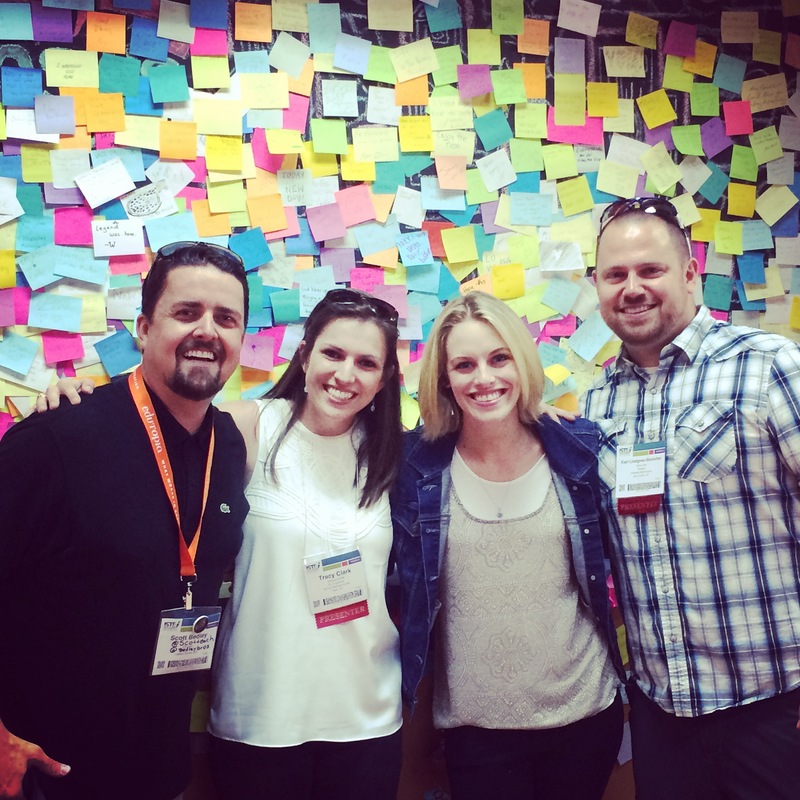 Instead of thinking about what we can get from the ISTE conference, we started thinking about what we can give. And not just at the conference itself, but what about the surrounding community of Philadelphia? 15,000 is a whole lot of people, what could a small mind shift do? 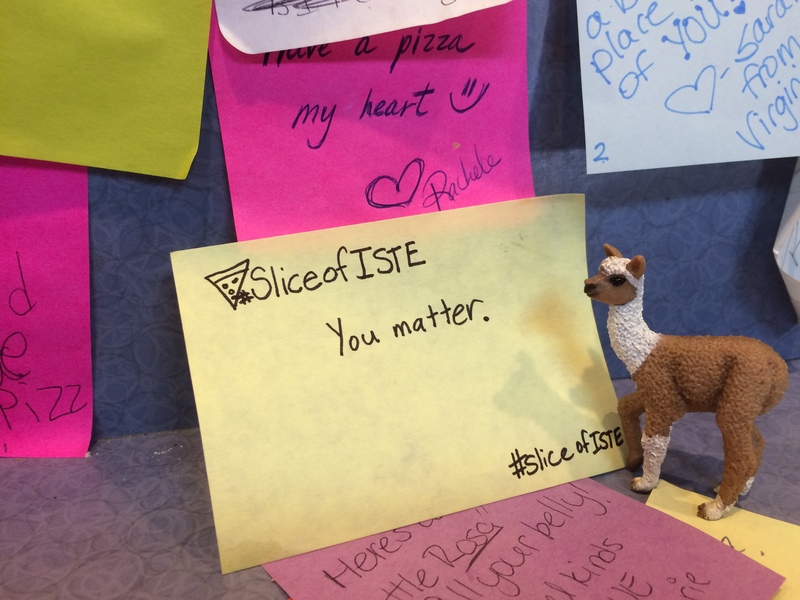 From these conversations, and Sara Boucher’s love of pizza, #sliceofISTE was born. The hope is to have ISTE attendees flood the local business, Rosa’s Pizza, which donates free slices of pizza to area folks in need of a meal. Buying a slice of pizza is a simple choice, at a small price, but there is a more important underlying shift in thinking we are hoping for. We want to be aware of the needs around us and look for other ways to serve the local community while in Philadelphia. It is about a posture of service instead of being served. It is about a shift from being a consumer to a creator, a doer. Be Inclusive. Remember the middle school lunch room? I’d rather not; that was horrible. Let’s make lunches and dinners and evening festivities as inclusive as possible. Make new friends, expand your horizons, and get out of the echo chamber. Be Observant. Notice someone who looks completely lost or overwhelmed or lonely? Talk to them, ask them: if you can help them find their way, if they want to tag along with you, or need a recommendation for a session to attend. Be Encouraging. Sometimes adults forget to be digital leaders themselves. I am all for free speech, but let’s be cheerleaders instead of trolls on the Twitters and in person. A heartfelt look in the eye and, “you will do great,” can be more powerful for a first time presenter than you realize. Be Generous. Leave room in your schedule to be generous. Share your ideas, your resources, your experience, and your time with others who are potentially in a different stage of learning this whole EdTech thing. Be Humble. We love you and your ideas and want them to spread too. But keep it classy and build up others. It is not always about you. So whether you are team #ISTE15 or #ISTE2015, whether this is your first ISTE or fifteenth, let’s all take a moment and think about the potential for positive impact in the communities where we go to learn. Extra Toppings. And one more question: What if conferences had committees, strands of service learning, or organized opportunities for groups to volunteer together at conferences? 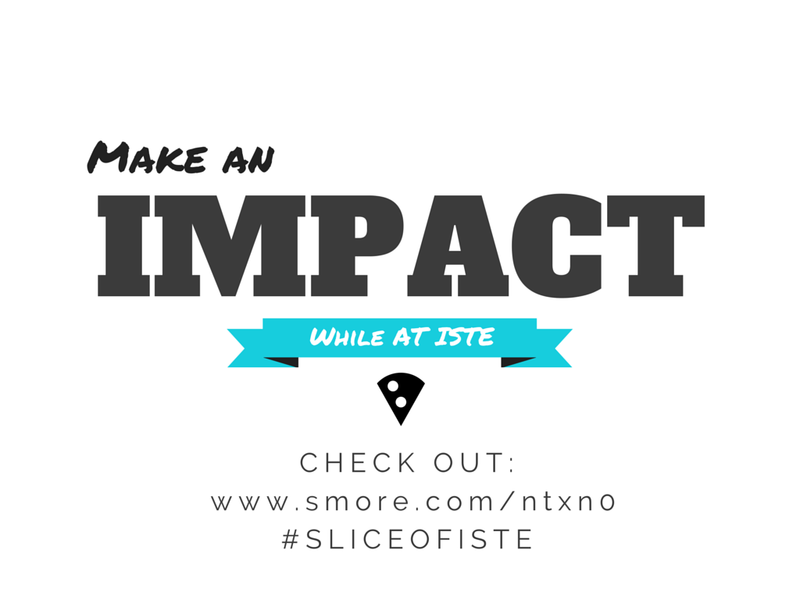 For more information on the #sliceofISTE movement, read Scott Bedley’s blog post, check out the Smore, and join us at Rosa’s.